With all the issues and legal problems the NFL has experienced over the past year, one player has been a bright star, and his name is Russell Wilson. This Sundays Playoff game against Green Bay was no exception, with Wilson throwing 3 interceptions in the first half and being down 16-0 at Halftime, Wilson lead the Seahawks to another miraculous comeback including Wilsons rushing touchdown and converted 2 pt conversion. Wilson had become a household name after leading Seattle to there franchises first Super Bowl win and a crushing defeat over the highly favorite Peyton Manning led Denver Broncos. The beginning of his NFL career wasn’t typical, before the draft Seattle went out and signed highly anticipated QB free agent Matt Flynn to a big contract. So when they drafted Wilson in the 3rd round they really had no expectations for him. Neither did the draft experts expect much from Wilson due to his size. But eventually by the end of the preseason Wilson won the starting job and has never looked back. (Deuteronomy 31:6) “Be strong and of a good courage, fear not, nor be afraid of them: for the LORD thy God, he it is that doth go with thee; he will not fail thee, nor forsake thee. Although Football in the grand scheme of life may not be relevant to everyone it is a sport that touches millions of peoples lives. 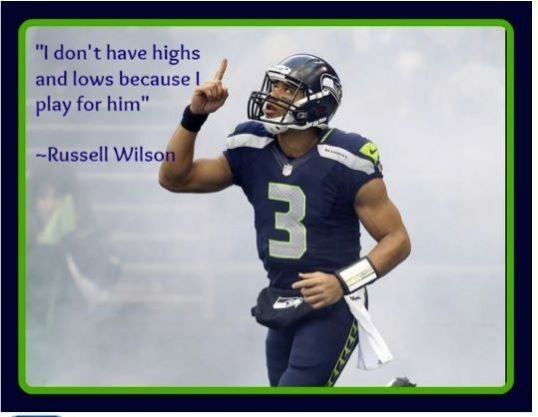 What a great example the Russell Wilson displays Christ to the world. Thru his professionalism and relentless attitude I believe hes a great role model for our youth and for the NFL in general. 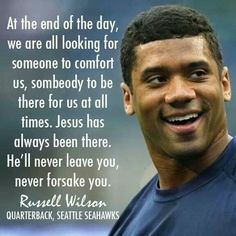 This entry was posted in Advent, Bible, Birthday, Christianity, Devotional, faith, God, Gospel, Jesus, NFL, Russell Wilson, Seahawks, Seattle and tagged Advent, Bible, Christianity, Devotional, Faith, God, Gospel, Jesus, NFL, Russell Wilson, Seahawks, Seattle on January 19, 2015 by Unashamed of Jesus.